The Bermuda Tourism Authority [BTA] will put a fresh take on celebrating the island’s food culture when it debuts a first-of-its-kind food truck festival next month. The BTA is organising the event in partnership with local food truck operators to create a festival on Front Street, Sunday, October 9, 2016. It will take place from 1:00pm to 6:00pm. The date was chosen because it’s the Columbus Day holiday weekend in the United States. “We’re inviting visitors on island for Columbus Day weekend to come into Hamilton and experience this delicious aspect of island life,” said Pat Phillip-Fairn, the BTA’s Chief Product and Experiences Development Officer. 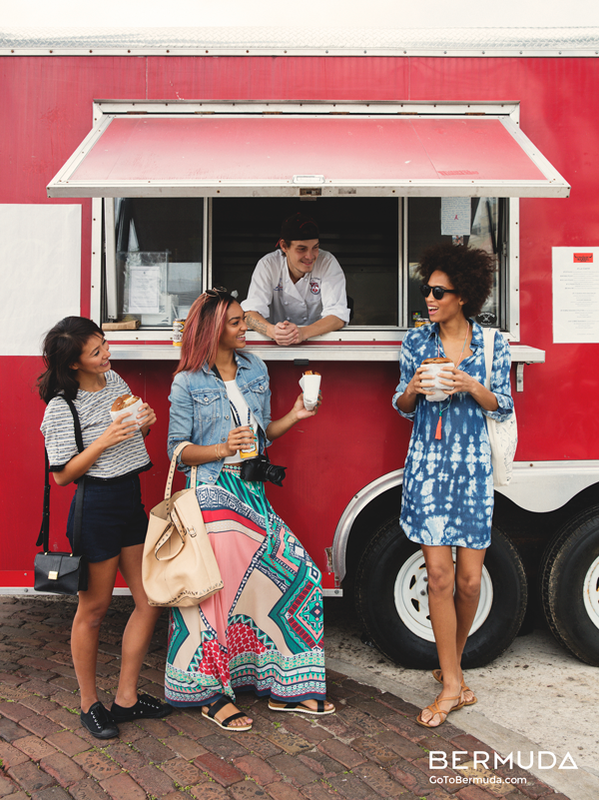 There will be 13 food trucks and pop-up vendors on hand for the Bermuda Food Truck Festival. Emphasis will be placed on Bermuda dishes, featured alongside traditional food truck favourites like fish sandwiches, hot dogs, snowballs and homemade lemonade. There is no admission. Everyone is welcomed. The line-up of local live entertainment includes the Simons Brothers, In Motion, Kennel Boys and Working Title. DJ Rusty G will bring an hour-long soca celebration during the festival. Since the BTA’s inception, the Product and Experiences team has worked with the culinary community to elevate the island’s food culture and infuse it into the visitor experience. “Those efforts have included popular Bermuda-inspired menus during Restaurant Weeks, last year’s competitive fish sandwich competition and the support of the City Food Festival. This is the BTA’s first formal partnership with food trucks and pop-up vendors. It’s being referred to as “a ‘greeze’ on wheels”. The Bermuda Food Truck Festival will take place on Front Street at No.1 Car Park. So they have a holiday for a navigator who was looking for a short cut to East India and stumbled on de Americas which was inhabited thousands of years before he got there !!!!!!!!!!!!!!!!!!!!!!!!!!!!!!! B) We don’t have a city of hamilton that has an exclusive, discretionary and limiting policy on who they allow in the city, example, they claim ‘they only have space’ for the food trucks they currently have in Hamilton and won’t entertain others. Congrats to BTA’s Product and Experience aka. Product Development. I wish it much success. Hopefully it’s going to be a Bermudaful Day!!! You cannot re-invent the wheel. Bring yah own BBQ and lets party. I’d bet someone would be offering those kind of meals,… maybe not the Donut place, but someone would. Hey I like food and I like trucks. This is gonna be awesome! What is the BTA ROI on this? Being taxpayer hosted do they get discount? Good idea but I have a feeling the most attendees will be Bermudians. It is obvious to me they are making it up as they go along and get bonuses or incentive awards. How dull. A food truck festival. Silly. Childish as the world moves with real culture and entertainment that is developed and not this type of nonsense. Next someone will get an award for the macaronni festival and the leapfrog and snowball festival. Surely the BTA empire can do better than this. Isn’t there a growing interest in food trucks? Thought Food Network and the like even have shows dedicated to food truck ‘competitions’ and whatnot. Whether or not BTA is a year behind on the times, maybe that could be a question. Your pessimistic attitude toward efforts such as these are the reasons they don’t succeed. You must forget you live on a 22 square mile island with access to very little resources. There is only room for so much ‘cultural development’… WHat would your pessimistic mind suggest since you aren’t ‘childish’? And for someone who is claiming that the world is developing through culture and entertain you must not travel much… Food truck festivals are extremely popular in other places of the world… (I would know because I’ve been to plenty). You also must not know much about culture because food truck festivals are designed to bring cultures together through a universal tool… FOOD. Seriously, when one thinks of food trucks in any other jurisdiction around the world we see innovative foody trucks with healthy tasty foods that make your taste buds pop. I see nothing on this list outside of Smokin Barrel that even come remotely close to what we should be seeing in this event. With that said I believe that the Corporation and the trucking venders committee are controlling who can come in and at a rediculas cost for a liecensing fee. Most of these food truck will serve you a heart attach on a bun. Nothing special here folks. Good luck with this event as there is nothing special here. I would rather watch paint dry. If I am wrong I would like these food venders to note three of there best hot food items on this form so we can all see what they are..? Burgers and fries need not be included.. Give us something amazingly tasty. Why no burgers and fries? I bet there would be some amazing burgers and fries in a cook off . @Northshore. Granted if the Burgers you speak of are outside the normal processed cardboard burger then I agree with you. Bring it on. A good afternoon mostly for locals. Should really be part of Harbour Nights. I want to see if I can get this straight – BTA wants to encourage tourists to come in Hamilton on a Sunday (when everything is closed) to eat at a food truck (which chances are they have more/better in the cities where they came from) – why??? I guess they are trying to capture the tourists that are here already and grow the product from there? by getting tourists to go to eat at a food truck on a day when the shops are closed??? If going to do that then why not have the food trucks down at Horeshoe bay or one of the other beaches – namely somewhere tourists will actually WANT to go?? YOU have a great idea here. Hope someone in the know reads this. The best crepes I ever enjoyed were from a food truck. They were chicken, mushroom, spinach, onion in a garlic cream sauce. Will there be any of those there on Oct. 9th?